WASHINGTON (CNN) -- In 2004, even after being captured by U.S. forces, Saddam Hussein told an FBI interrogator he believed Iran was a greater threat to Iraq than the United States, according to newly released FBI documents. 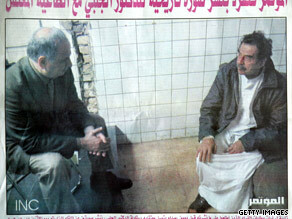 Baghdad's Al Mutamar newspaper shows Saddam Hussein, right, with Ahmed Chalabi of Iraq's governing council in 2003. The FBI interviews took place while Hussein, then identified by the FBI as "High Value Detainee 1" was held captive by U.S. military forces at Baghdad International Airport between February and June of 2004. Hussein regarded the Iranian threat as so serious that it was the major factor in his decision not to allow United Nations weapons inspectors to return, he said. Citing their shared border and his belief Iran would intend to annex southern Iraq, Hussein said he was more concerned about Iran discovering Iraq's weaknesses than repercussions from the United States and the international community. He believed that the inspectors would have directly identified to the Iranians where to inflict maximum damage to Iraq. Approximately 100 pages of declassified interview summaries, previously classified as secret, were obtained by the National Security Archive at the George Washington University through a Freedom of Information Act request. The FBI declined CNN's request to interview special agent George L. Piro, the agent who interviewed Hussein. FBI spokesman Paul Bresson declined to comment on the declassified documents. "As a general rule, the FBI does not discuss FOIA'd documents. We let the information stand on its own," Bresson told CNN. Piro, an FBI agent fluent in Arabic, conducted the interviews along with another agent whose name has been redacted from the documents. Although Hussein had been a prisoner for months, at one point during an interview he said, "I am not the ex-president of Iraq. I am still the president of Iraq." Hussein also described al Qaeda leader Osama bin Laden as a "zealot" and said he had never met or seen him. He also said the United States used the September 11 attacks as justification to attack Iraq, and that the United States had "lost sight of the cause." Despite Piro citing evidence of Iraq's contacts with al Qaeda, Hussein said, "The Iraqi government did not cooperate with bin Laden" and that the two "did not have the same belief or vision." The former regime's alleged weapons of mass destruction and alleged ties to al Qaeda were the Bush administration's primary justifications for invading Iraq in March of 2003. Piro and Hussein spoke extensively about Iraq's chemical weapons during the Iran war, the 1990 invasion of Kuwait and in the years before the second U.S. invasion. Hussein refused to answer a question about whether Iraq would have lost the war it fought with Iran from 1980 to 1988 if it had not used chemical weapons. He also said neither he nor any other Iraqi officials discussed using chemical weapons during the first Gulf War. Hussein admitted that Iraq made a mistake by destroying some weapons without U.N. supervision. In his view, the inspectors wanted all of their expenses paid for by Iraq. Instead of waiting for the inspectors and paying the expenses, Iraq began destroying the weapons. "We destroyed them. We told you, with documents. That's it," Hussein said. When asked about restrictions he placed on weapons inspectors regarding which locations they could visit, Hussein responded, "By God, if I had such weapons, I would have used them in the fight against the United States." Hussein commented about the mental state of U.S. soldiers occupying Iraq. "If you asked the American soldier -- who came to Iraq to find weapons of mass destruction, but none could be found, and who came to remove the leaders of the Hussein dictatorship, who are all in jail now, but are replaced with other dictators -- whether he wanted to stay or go, he would say go." Hussein said he alone gave the orders to fire SCUD missiles at Israel during the first Gulf War, adding, "Everything that happened to us was because of Israel." He said he figured that the United States would stop the war if Israel was "hurt," and he wanted to punish the country he viewed as the source of all his problems. Hussein recalled a meeting in Switzerland between his foreign minister Tariq Aziz and then-U.S. Secretary of State James Baker in January of 1991 shortly before Operation Desert Storm. According to Hussein, Baker offered no solutions to resolve the Kuwait situation and gave specific steps to Aziz that the United States wanted Iraq to do first, and Baker added "otherwise, we'll take you back to the pre-industrial age." He also told Piro he wanted to have a relationship with the United States but was not given the opportunity because in his view the United States was not listening to anything Iraq had to say. Hussein also revealed details about his security measures and movements before and after the second U.S. invasion of Iraq in March of 2003. He says he had only used a telephone on two occasions since March of 1990. He denied ever using body doubles, claiming, "This is movie magic, not reality." He also said he never saw his sons use body doubles. "Do not think I am getting upset when you mention my sons. I still think about them and the fact that they were martyred. They will be examples to everyone throughout the world," he said. Hussein also states he was not in the Dora neighborhood of Baghdad on March 19, 2003, when it was bombed by coalition forces in an unsuccessful attempt to kill him. He says he remained in Baghdad until April 10 or 11 of 2003, when it appeared the city was about to fall to coalition forces. Before leaving the city, he said he held one final meeting with the senior Iraqi leadership and told them, "We will struggle in secret." Shortly after his departure from the capital, Hussein began to gradually disperse his bodyguards, telling them they had completed their duty, so as not to draw attention. Hussein also admitted that after participating in the failed assassination attempt against then-Iraqi president Gen. Abdul Karim Qasim in 1959, he had stayed at the same farm where he was captured by U.S. forces in December of 2003. CNN's Carol Cratty contributed to this report.